We are proud to add a new configuration to our successful line of Bulgarian-made SAM7K 7.62x39 caliber pistols, now with Sig Sauers SB15 pistol stabilizing brace*. The Sig Sauers SB15 pistol stabilizing brace is a veteran-designed aid that is made to improve the single-handed shooting performance of a pistol. By using the operators forearm, it provides a stable support to reduce felt recoil and minimize accuracy-robbing spin and shift. The stabilizing brace sits on the receiver extension, and the flexible cuff with two adjustable nylon straps allows the brace to be custom fit to any user. The receiver extension has a water proof storage compartment with a sealing threaded cap. It is accessible when the brace is removed or pushed all the way forward. The SAM7K-03 7.62x39mm caliber pistol combines authentic, high-quality features rarely seen in the American market. 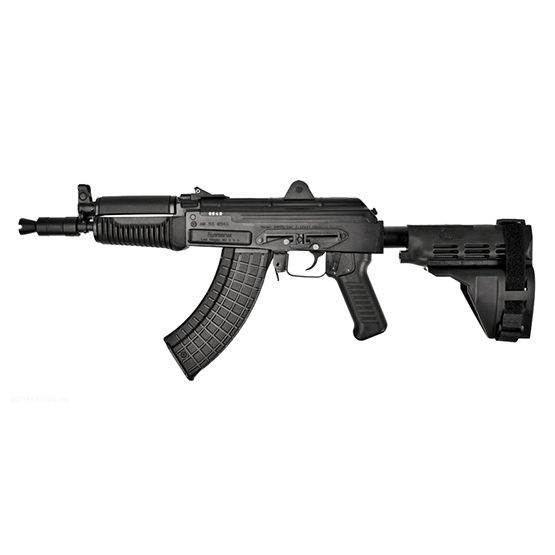 Every component of the SAM7K-03 is engineered to provide decades of dependable service. The SAM7K-03 pistol is ideal for sport shooting, self-defense, and for pistol hunting. The SAM7K-03 adds a new chapter to the best pistol of its kind in the world. Each SAM7K-03 pistol receiver is milled from a hot-die hammer forged receiver blank by the Arsenal Co. of Bulgaria. Other milled-receivers are machined from bar stock, but Arsenals hot-die hammer forging produces stronger and finer-grained steel. Internal voids and cooling deformations are eliminated by the 5-ton hammer forging process. Each SAM7K-03 forged pistol receiver starts out as a blank and requires over 5.5 hours of milling before assembly. This forging and milling process is very complex and time-intensive, but with our meticulous attention to detail, we deliver a receiver of unequalled strength, precision, and durability. Summary: SAM7K-03 - 7.62x39mm caliber Pistol, milled receiver (hot-die hammer forged), short gas system, front sight block / gas block combination, 10 1/2 inch chrome lined hammer forged barrel, black polymer furniture, Sig Sauer pistol stabilizing brace, original pistol grip made to work with ambidextrous safety lever, peep rear sight, scope rail. Includes one 5-round magazine, sling, oil bottle, and cleaning kit.